7 Things To Know About Israeli Settlements : Parallels West Bank settlements have expanded under every Israeli government over the past half-century. Nearly 10 percent of Israel's Jewish population now lives on land captured in the 1967 Six-Day War. Palestinians and Israeli activists run away from tear gas fired by Israeli soldiers during a demonstration against the construction of Jewish settlements in the Jordan Valley, in the West Bank, on Nov. 17. When Israel captured the West Bank in the 1967 Six-Day War, no Israeli citizens had lived in the territory for nearly two decades, since an earlier war. But in 1968, a small group of religious Jews rented rooms at the Park Hotel in Hebron for Passover, saying they wanted to be near the Tomb of the Patriarchs, one of the holiest sites in Judaism (as well as Islam and Christianity). The Israeli government reluctantly allowed them to stay "temporarily." From that beginning, hundreds of thousands of Israeli Jews now reside in the West Bank, citing religion, history and Israel's security among their reasons for being there. But the Palestinians, along with the rest of the world, see their presence as one of the key obstacles to a peace agreement and the creation of a Palestinian state. The issue returned to the headlines when the United Nations Security Council recently voted 14 to 0 to condemn Israeli settlements. The United States, which often vetoes resolutions critical of Israel, abstained and allowed the resolution to pass. Prime Minister Benjamin Netanyahu responded angrily, unleashing a stream of accusations against the Obama administration. U.S. Secretary of State John Kerry defended the U.S. position Wednesday in a lengthy speech that repeatedly admonished Israel over settlements. The term "settlements" may conjure up images of small encampments or temporary housing, and many have started that way. But they now include large subdivisions, even sizable cities, with manicured lawns and streets full of middle-class villas often set on arid hilltops. Israel is constantly building new homes and offers financial incentives for Israelis to live in the West Bank. When the Israelis and Palestinians first began peace talks after a 1993 interim agreement, the West Bank settlers numbered a little over 100,000. Today they total around 400,000 and live in about 130 separate settlements (this doesn't include East Jerusalem, which we'll address in a moment). They have grown under every Israeli government over the past half-century despite consistent international opposition. Hard-line leaders like Netanyahu have actively supported them. 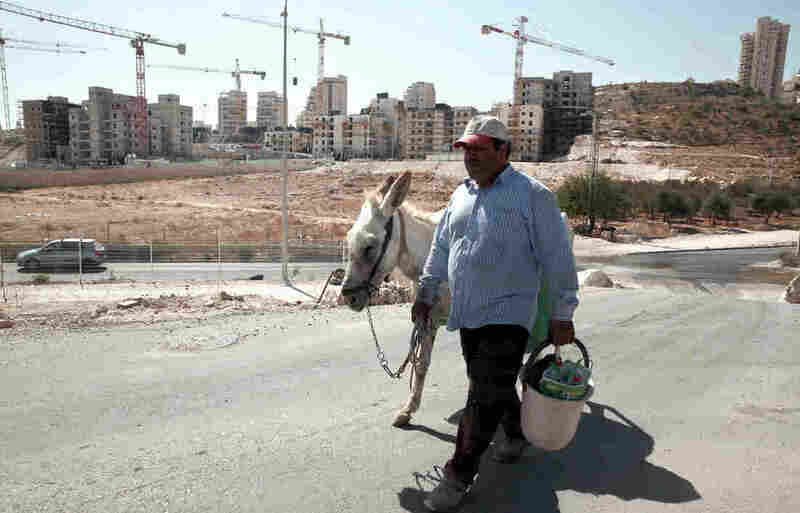 Moderates and liberals have also allowed settlements to expand, though usually at a slower rate. The settler movement is a powerful political force, and any prime minister who takes it on risks the collapse of his government. You can click here to see data on the settlements and a detailed map from Peace Now, an Israeli group that is opposed to settlements and closely monitors them. Critics of settlements say they've intentionally been established in every corner of the West Bank, giving the Israeli military a reason to be present throughout the territory and making it impossible to create a viable Palestinian state. 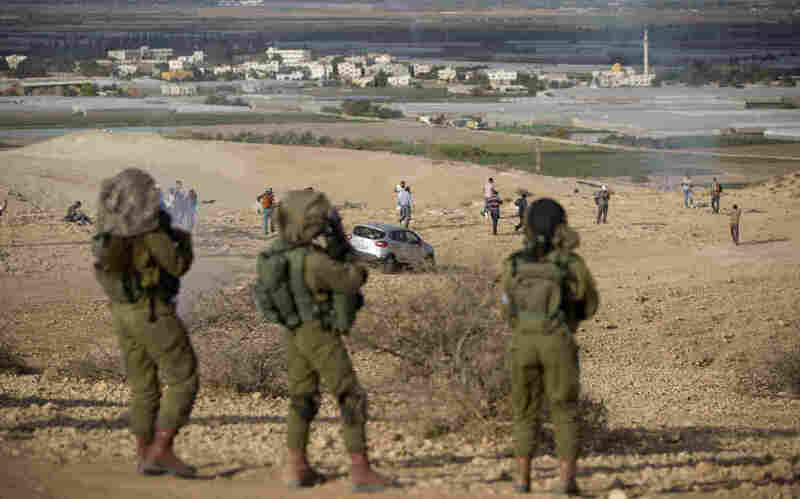 The settlement locations and the roads that connect them make Palestinian movement difficult. The settlements are just one of many obstacles to a peace deal. Drawing boundaries, the status of Jerusalem, the fate of Palestinian refugees, and myriad security questions — including terrorism — are equally challenging, if not more so. A Palestinian man walks near a construction site for new Israeli housing in the East Jerusalem neighborhood of Har Homa in September. The Palestinians claim East Jerusalem as a capital of a future state and object to Israeli building in the eastern part of the city and throughout the West Bank. Israel claims all of Jerusalem as its capital. And as the settlements grow, it will be increasingly difficult to remove a large number of them, a tactic known as "creating facts on the ground." Shortly after the 1967 war, Israel annexed East Jerusalem, which is part of the West Bank and had a population that was then entirely Palestinian. Israel declared the entire city to be Israel's "eternal and indivisible" capital. No other country recognizes Israel's annexation of East Jerusalem, with the United States and others saying the city's status must be determined in negotiations. This is why the U.S. and other countries have never moved their embassies to Jerusalem. Most are in Tel Aviv. The Palestinians, meanwhile, claim the eastern part of the city as their future capital. Around 200,000 Israelis now live in East Jerusalem. Combined with the roughly 400,000 settlers in the West Bank, about 600,000 Israelis now live beyond the country's 1967 borders. That's nearly 10 percent of Israel's 6.3 million Jewish citizens. While the Israelis tend to speak of East Jerusalem and the West Bank as two separate entities, the Palestinians regard them as a single body — the occupied West Bank. 4. What does Israel say about settlements? The settlers and their supporters cite the Jewish Bible, thousands of years of Jewish history, and Israel's need for "strategic depth" as reasons for living in the West Bank. They also note that Israel took the territory from Jordan, which has since relinquished its claim to the West Bank. Therefore, the settlers argue, there is no legal sovereign in the territory. However, no country, not even Israel, considers West Bank settlements to be sovereign Israeli territory. As we noted, Israel annexed East Jerusalem and administers it as part of Israel. But Israel has never annexed any other part of the West Bank. The settlers want to be formally incorporated into Israel, but that would ignite a major controversy. For now, Israel regards the West Bank as "disputed" territory that has been under the Israeli military since the 1967 war. 5. How about the Palestinians? From some Palestinian cities, there are clear views of Israeli settlements — and new construction — on nearby hillsides. And in most settlement neighborhoods, there are wide areas of empty hillside closed to Palestinians, which Israel says are necessary buffers for security. Palestinians see them as visual proof that their sought-after independent state is being taken from them. Palestinian leaders have opposed peace talks in recent years while, as they see it, Israel is building on land that is part of those talks. 6. Has Israel ever dismantled settlements? Yes, on a few occasions, most notably in 2005, when it removed all 8,000 settlers from the Gaza Strip. Israel decided these small, isolated settlements were too difficult to defend in a territory where the Jewish residents accounted for less than 1 percent of the population. The evacuation of the settlements was deeply divisive within Israel, and Israel's security forces had to drag some settlers from their homes kicking and screaming. The episode demonstrated that Israel could remove settlers, but it also showed how much friction it creates inside Israel. 7. What are the proposed solutions? Kerry on Wednesday outlined the general approach: land swaps. Under this scenario, the largest Jewish settlements, which are near the boundary with Israel, would formally become Israeli territory. In exchange, Israel would turn over an equal amount of its current land that would become part of a Palestinian state. In addition, settlements deep in the West Bank, far from Israel, would be disbanded. It would be a difficult political move for an Israeli prime minister, but it would also be difficult for a Palestinian leader to accept a peace deal without removing settlements.